What FCPA Activity Should We Expect to See in 2014? 2013 saw several important developments in the enforcement of the Foreign Corrupt Practices Act (FCPA). The US Department of Justice and the SEC collected in excess of $635,000,000 combined in civil and criminal penalties from individual and corporate investigations. The first month of 2014 saw the collection of $384,000,000 in a single settlement. The DOJ and the SEC expanded their enforcement capabilities in 2013, and increased their actions nearly two and a half times, compared to 2012. What should we expect to see in 2014? In 2013, FCPA enforcement expanded to 19 countries on every continent, except Australia and Antarctica. Industries targeted were oil and gas, apparel, technology, financial services, and medical companies. A DOJ official said that 2013 was the fifth-biggest year in the statute’s history for penalties paid. The average corporate penalty paid in 2013 was $74 million, similar to settlements paid out in 2011, but more than double the average penalty paid in 2012. And by all indicators, larger penalties are becoming the norm. Avon, a cosmetics manufacturer, disclosed in August 2013 that DOJ and SEC had rejected its settlement offer of $12 million for charges of improper promotion practices in China. The company wrote in its October 2013 filing that counteroffers from the SEC staff were unreasonably high. The rising cost of FCPA enforcement is illustrated by the December 2013 announcement of a $32 million government settlement with construction company Bilfinger SE, to resolve charges that Bilfinger used bribery to obtain a contract on a Nigerian gas pipeline project. Organizations’ self-reporting is being encouraged by authorities. Instances of self-reporting may have been spurred on by the whistleblower provisions of the Dodd-Frank Act. The desire to avoid large payouts to whistleblowers might motivate companies to report allegations after only preliminary investigation. Legal discretion might be exercised if companies cooperate, lead thorough investigations and voluntarily disclose relevant information. Now, more than ever, wrongdoers are being held accountable. It is not just the United States that is the first to act on its investigations. Following the foreign arrest of employees of the Polish subsidiary of Philips Electronics for health care-related bribery in 2009, the company conducted an internal investigation into the conduct in question and elected to self-report its findings to the SEC and DOJ in 2010. It agreed to pay $4.5 million to the SEC to resolve charges that the Polish subsidiary’s employees made payments to public officials in order to secure public tenders for the purchase of certain medical equipment. Although the United Kingdom’s Serious Fraud Office (SFO) has yet to bring a corporate prosecution since the implementation of the UK Bribery Act in 2010, the office appears to be making increasingly concerted efforts to target major corporations. In August 2013, the first charges were brought, under the Bribery Act, against four executives of Sustainable AgroEnergy plc, in connection with an alleged £23 million fraud relating to the sale of biofuel investment products. And in December 2013, UK aircraft engine manufacturer Rolls-Royce Holdings plc announced that the SFO had commenced a criminal investigation into allegations that the company bribed officials in China and Indonesia through third-party intermediaries. The enactment of the UK Crime and Courts Act in August 2013 also is expected to significantly change the UK’s approach to dealing with bribery and corruption. That legislation introduced the National Crime Agency, a new government organization that will have both an investigatory and criminal intelligence function (similar to the FBI), to work alongside the SFO. The Crime and Courts Act also provides additional tools for the SFO to address bribery and corruption. Deferred prosecution agreements were made available for the first time in the UK in February 2014. As well, there are proposals to offer financial incentives to whistleblowers. The net effect of these changes is that the UK enforcement environment will now trend toward the US enforcement climate. Lack of sufficient internal controls create a corporate environment where illegal bribery is acceptable. 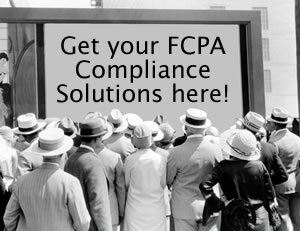 Given some of the high-dollar settlements announced last year and the signals from public announcements in early 2014, it seems likely that the cost of noncompliance with the FCPA will rise in the coming year. Independent self-assessment and internal investigation, however, will continue to serve as a sound investment in minimizing FCPA risks and increasing a company’s chances of working cooperatively with the government to resolve liability for potential violations of the statute. Integration of a whistleblower hotline is another tool to help manage risk. Waste, fraud and abuse of authority can all be combated by having an independent reporting mechanism that’s available to your employees to report malfeasance. WhistleBlower Security should be one of the first places your employees can go to report on any perceived wrongdoing or perceived risk.